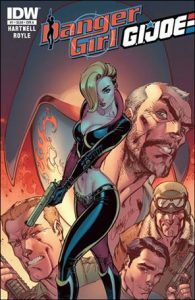 Constantin Film acquired rights to the comic book series Danger Girl, and will team with Jeremy Bolt’s Bolt Pictures and Adrian Askarieh’s Prime Universe Films to produce a film and develop a TV show from the property. Constantin’s Robert Kulzer will produce along with Bolt and Askarieh. Constantin’s Martin Moszkowicz will be exec producer along with the comic’s creators, J. Scott Campbell and Andy Hartnell. They will go out to writers and directors immediately. Launched in 1996 by comic book artist J. Scott Campbell and writer Andy Hartnell, Danger Girl began under the Wildstorm banner and moved to DC Comics. It has spawned merchandising, including video games, action figures, board games, and high-end collectibles. The heroine is adventurer Abbey Chase. Reluctantly recruited by a secret spy organization, she teams with fellow operatives Sydney Savage and Natalia Kasstle to locate a series of mystical objects and keep them out of the hands of the criminal enterprise The Hammer Syndicate.